High Drain Type models are derived from the Standard Type in order to meet with market demand growing for pulse discharge and cycle use more than conventional backup applications. Q-Lite High Drain Type batteries are capable of delivering excellent pulse discharge performance with optimized life cycles, which are becoming more and more dominating the market nowadays. Note: Rated capacities are for reference only and subject to new confirmation in data sheets updated. CRW cells/batteries refer to Q-Lite new product launch in 2017 in order to cope with robust market demands for high capacity and high power output in lithium Manganese Dioxide technology nowadays. Customers may see the main characteristics of tab-welded Q-Lite batteries in their part members. Z: tabs are bended in "Z" shape. "-" refers to the tabs that have slight difference from the standard tabs. Since some of the variation numbers have been issued in the past, difference may be found apart from the above system. Pull test is carried out to check the strength of tabs soldering. A pull test setup is shown below. For all other models, pull weight be 4 kg. Lithium manganese dioxide cells, apart from for traditional applications, are becoming more dominating the market shares nowadays. It has been successfully applied to mini type electronic devices such as IC memory power back up, luminous products, and tele-controllers, etc. The reason mainly lies in that the lithium metal, acting as the cathode active substance, has the highest capacitance (3.86 Ah / g) and high electrode potential among all available cathode metals, performance being quite stable under sealed humid storage and an excellent and long service life. The lithium battery features a voltage of more than 3V, twice of conventional batteries, and the lithium metal, acting as the cathode active substance, has the highest capacitance (3.86 Ah / g), thus saving power space and reducing weight for designed product. Reliable sealing structure, high quality electrolyte and anode & cathode active substances which makes a super sealing-up capability in battery. Adopting the reliable conductible organic electrolyte liquor ensures the battery an excellent performance of working between -20oC~+60oC temperature range. The battery, specially formulated and processed, is also applicable for -40oC~+80oC requirement. For the battery, 2% or less annual self-discharge can be expected. High rate discharge batteries are available from Q-Lite manufacture. Please see to High Rate Type. Battery contains flammable materials as organic solvent. Misuse of battery may cause leakage, heating, inflammation and even explosion. Never charge the battery. Forced charging will result in explosion. Keep battery from child. See the doctor immediately if battery swallowed by child. If battery electrolyte sputters to eyes or mouth, be sure to use water wash immediately; or contact the doctor if seriously sputtered. Don't heat battery, place it nearby fire, put it into water, or dismantle, which may damage the battery, cause leakage, fire or explosion. The battery with electrolyte leakage or odor emission cannot be placed near to fire, otherwise may cause inflammation. Don't connect the positive and negative directly, for it will result in short-circuit. Avoid mixing the battery with metals or any other electrically conductive objects, for this may cause short circuit, quick heating or explosion. During storage, please keep all individual batteries apart from each other so to avoid short circuit due to positive and negative possibly connected directly. Be sure to let the batteries’ positive and negative parts placed correctly in products and strictly follow the product user instructions. In use do not mix used and new batteries together, different brands, models of batteries. It will lead to battery performance deterioration quickly. According to the regulations of «UN Recommendations on the Transport of Dangerous Good», "Special Provision 188", if lithium batteries avoid the mutual short-circuit among batteries and proper safety protection is conducted for packing during the transport period, then the lithium batteries with not more than 1.0g lithium/cell will be regarded as safety products. The Q-Lite lithium-manganese dioxide button type batteries completely comply with the technical requirements of this transport criterion. c) the ambient working temperature. When working in a low temperature condition, IC's working current will be reduced to a lower level and the battery voltage going down correspondently, while in a permanent High Temperature working environment, High Temperature effect will cause a bad self-discharge to the battery and battery capacity will deteriorate in an obvious way. Accordingly, we are supposed to deduct the partial capacity wasted due to High Temperature effect while calculating battery service life, which is one of the vital factors for consideration. VB - VF - IF × R > V IC. It is recommended to adopt a diode with minimized reverse leakage current and to set up the right designed circuit, so that the diode's reverse leakage current while the battery in service is not to exceed the 2% of battery’s rated capacity. In this case, the diode to be selected is to have its reverse leakage current less than 0.34 µA. It is necessary to set up protective current-limit resistance in circuit, which shall restrict the current of battery charging in case of diode out of service, and risk due to battery being charged by a big current is also to be avoided. No direct soldering onto battery. A long-time direct heating on battery may result in damage and distortion to the separator and sealing gasket, causing leakage, fire and even explosion. In case soldering is needed to connect batteries, please use right specified pins to connect batteries. While batteries with pins are connected, please make sure the battery surface temperature is not to exceed 80oC. It is recommended to use nickel plated material or stainless steel to be pins for battery. For the replaceable spring-leaf-elastic contact, it is recommended to keep contact pressure within the limit of 200~1000 gf and to use multi spot contact (normally, two spots), so to ensure stability and reliability of contact. The contact points shall be right positioned around battery in order to achieve the best balancing and positioning of battery. Particularly for a portable device with battery, sufficient consideration is to be taken of vibration compact onto battery contact. The battery compartment shall be designed with its dimensions as close as possible to those of battery body, not too loose, furthermore, to select highly elastic contact pressure and high elastic spring leaf with good structure, so to avoid bad contact owing to battery removal after vibration. Battery with pins is to be used for those electrical appliances with a need for highly reliable battery contact. Keep clean the battery pins’ surface, not let wet or covered with sticky objects, otherwise there will be bad contact on pins. Before putting battery in service, be sure to check everything normal on pins and if there is any cut or damage with them. The pins once cut or damaged may cause short circuit. Don't over-discharge battery to 0 V.
Lithium manganese dioxide battery still keeps a high level output voltage even if its capacity mostly exhausted, and often does not make any difference with new ones in voltage. In order to avoid mix use of old batteries and new ones, and when it is not so easy to distinguish between them, it is recommended to replace with new batteries absolutely. When lithium manganese dioxide battery becomes short circuited even for a short while, its voltage will be declining obviously. However, it features a recovery performance, and to what extent the recovery is depends upon to what extent the battery is short circuited, though. Lithium manganese dioxide battery needs a certain period of time to recover its electrical performance even if a minor short circuit. Therefore, we have to wait enough time in case of short circuit until the battery recovers to normal voltage before we can conduct any test on it. It is recommended to use a voltmeter with a more than 1 MOhm resistance in order to obtain an exact measurement of open circuit voltage of battery. Even if batteries are the same in size or shape, their performance may differ from each other due to different sizes and grades. Upon replacing batteries, be sure to verify the model and grade of every battery and replace according to the specified model and grade. When designing battery into electrical appliances, battery loading and unloading structure shall be designed not reachable to children, so to avoid being possibly swallowed by children. For transportation, manufacturers’ transport and carriage instructions shall be obeyed. Always avoid excessive vibration or tough loading or unloading. When there are a few batteries to be used in series or in parallel, or in more complicated conditions, please consult Q-Lite engineer or agents. Unlike other electronic components, the lithium-manganese dioxide button type battery may become short circuited once placed onto the PCB board even if PCB power not switched on. As a result, the battery energy will be exhausted when the PCB switched on. Indicated by the below diagram (Sketch Map of Battery Exterior Short-Circuit), the positive and negative terminals of lithium-manganese dioxide button type battery are separated only with a slim ring (sealing gasket), so the positive and negative will easily get connected short circuited when the batteries are piled up overlapped in a disorder. 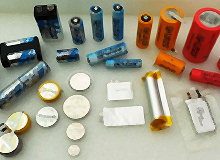 Batteries may get short circuited through the electrically conductive metal surface, which is similar to overlapped piling up of batteries, depending upon which positions batteries will be left in the metal containers. The conductive metal tweezers will cause the battery a short circuit while battery being picked up. Some external forces, i.e. being pressed by other objects, will make both the positive and negative pins bend crossed directly, thus causing short circuit. An improper soldering may cause short circuit through unwanted solder slag left on the PCB. The solder slag will form the "solder bridge". in solder trailing may form. Similar to the "solder bridge", the electric iron may cause short circuit by connecting positive and negative terminals. The longer the soldering time is, the more energy will be exhausted out of battery. A soldering operation by hand is recommended to be done within five seconds. Short circuit may be caused owing to some conductive materials contacted (i.e. extruding solder spots) when the PCB’s are placed piled up. The electrically conductive pad is usually used to prevent the semiconductor component from being damaged by conductivity. When a PCB already with battery installed inside is placed onto the electrically conductive pad, the soldering spot on the conductive body will cause discharge circuit by contacting the pad. When a battery is installed with reverse polarities into the battery container, the battery may be discharged depending upon the electrical current direction in the circuit. When the battery pins (both positive and negative) are immerged into the soldering liquid for processing (as for tin processing), the battery will be short-circuited immediately discharged. It is requested that such a processing be done in 5 seconds, the quicker the better. 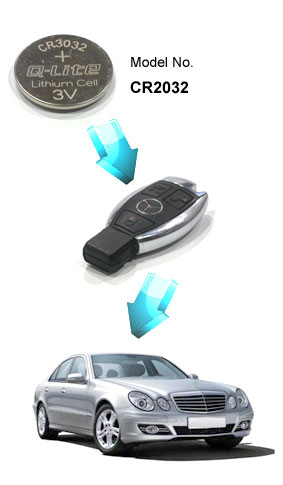 Q-Lite CR2032 model is currently available for car key remote control application. 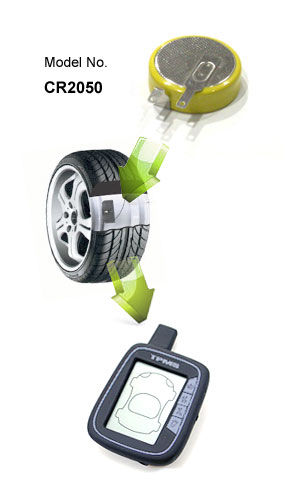 TPMS project battery development roading. CR2050 expects to be released soon.